30 June 2017 – Yangon, Myanmar: The largest sports media property in Asian history, ONE Championship™ (ONE), electrified the Thuwunna Indoor Stadium with another blockbuster evening of authentic martial arts. The beautiful city of Yangon played host to ONE: LIGHT OF A NATION, which showcased the absolute best in local and international martial arts talent. In the main event, Aung La N Sang was crowned the new ONE Middleweight World Champion with a unanimous decision victory over Vitaly Bigdash. 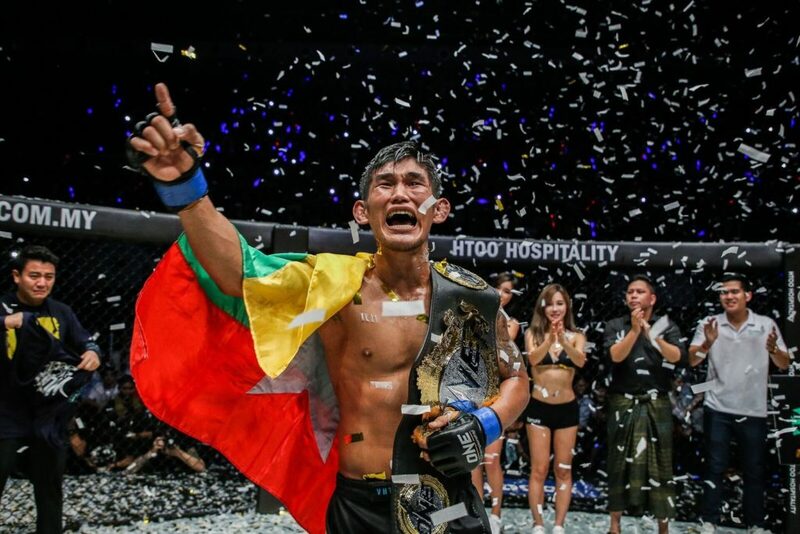 In the main event, Myanmar national icon “The Burmese Python” Aung La N Sang brought the crowd up to their feet with a spectacular performance, defeating Russia’s Vitaly Bigdash to be crowned the new ONE Middleweight World Champion. In the first round, Aung La staggered Bigdash with a blistering combination that had him reeling against the cage fence. Bigdash, in a display of incredible toughness and warrior mindset, survived the round to the best of his ability. The rest of the bout saw both competitors each have their moments in what was a very close contest. In the end, all three judges scored in favor of Aung La who took home a hard-earned unanimous decision victory. “AGD Bank is proud of our national hero Aung La N Sang for his tremendous achievement tonight. He has united the nation and serves as an inspiration to all of us. We are also very proud of the Myanmar athletes who have fought tonight. I hope this is the start of a golden era of Myanmar Lethwei martial arts athletes excelling on the international stage,” said Htoo Htet Tay Za, Managing Director of AGD Bank. In the Yangon Flyweight Tournament Final, Saw Min Min captured the championship trophy, earning the respect of his hometown crowd with a spirited performance against compatriot Shwe Kyaung Thar. Saw Min Min finished his opponent via guillotine choke just under two minutes into the first round to be crowned Tournament Champion. It was a delightful showcase of local talent, one that promises a bright future for Myanmar’s budding martial arts ecosystem. In a back-and-forth battle between two former ONE world title challengers, Japan’s Mei “V.V” Yamaguchi and Chinese Taipei’s Jenny Huang brought the crowd up to their feet with a spectacular performance. It was a battle of two well-rounded competitors who each had their moments in a tough bout. After a first round which saw Yamaguchi take Huang down to the canvas with her wrestling, the Japanese martial artist opened up the second round looking to put on the finishing touches. Using her experience, Yamaguchi took Huang’s back and sunk in a rear naked choke to force the tap. Former Brazilian jiu-jitsu No Gi world champion Bruno Pucci scored the first technical knockout victory of his career, stopping Filipino featherweight Jimmy “The Silencer” Yabo with a volley of strikes from full mount. As soon as the bout began, Pucci wasted no time in hunting for the takedown which he got on the first attempt. On the mat, Pucci easily passed guard, earning the finish shortly after. In a stunning battle between two former Lethwei practitioners, local bantamweight Tha Pyay Nyo made very quick work of opponent Htet Aung Oo to win by shocking knockout. As soon as the bell rang, the two warriors collided at the center of the cage looking to throw haymakers. Tha Pyay Nyo then connected on a picture-perfect right straight to send Htet Aung Oo crashing to the canvas, ending the bout just 16-seconds into the very first round. South Korean prospect Kevin “Oldboy” Chung made his ONE Championship debut opposite Chinese warrior Zhong Qing Ya in an action-packed affair. In the first round, Chung used his speed and power to connect on a handful of thudding strikes on Zhong who defended well against takedown attempts. In the second round, Chung finally took Zhong down with a double-leg and went straight to work on the ground-and-pound, landing a series of sharp elbows. Referee Yuji Shimada called a halt to the contest in round two after Chung connected cleanly on two knees from side control. In two tough contests, the Yangon Flyweight Tournament kicked off all the action at ONE: LIGHT OF A NATION with explosive semi-final matchups. Saw Min Min won the first bout, knocking out opponent Kyar Ba Hein, while Ye Thway Ne battled Pat Kyaw Lin Naing in the second bout to win by unanimous decision after two rounds.